I love Australia from the brief bits of Sydney and Melbourne I’ve seen, and I can’t wait to return. As you may or may not know, Canadian and American nationals are required to get an ETA (Electronic Travel Authority) before boarding their flights for entrance into Australia. The ETA allows multiple entries of up to three months during a 12 month period for leisure visits. This application also applies to BRUNEI, HONG KONG (SAR), JAPAN, MALAYSIA, SINGAPORE & SOUTH KOREA nationals. You can normally get it done online instantly (or within a few days) on the official site, which will cost you $20 AUD per person. If you forget, then you can may also be able to get it at the airport check-in counters for a higher price. Until today I had always been using the online website to apply, but today somehow I stumbled onto this pretty awesome Flyertalk thread. 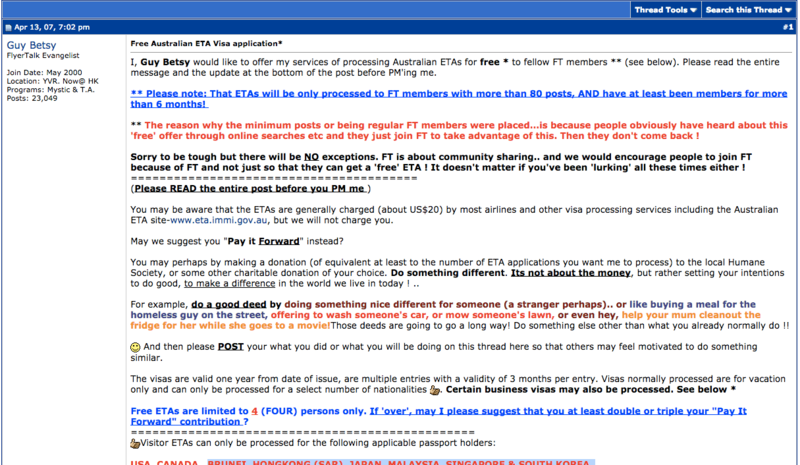 The poster in this thread is offering all Flyertalk members who have a 80+ post count and 6+ month Flyertalk history a free application for their Australian ETA. Instead of paying the fee, the post recommends you to pay it forward by making a charitable donation, or an equivalent good deed to make a difference in the world. I haven’t done this myself so I don’t know what the process is. However, this thread has been around for 7 years with 48 pages of posts, so it’s extremely likely a legitimate process. Since I personally had no idea this existed, I thought I’d share it with y’all, and most definitely will be using this route to get an ETA without paying processing fees the next time I travel to Australia. Oftentimes Flyertalk is a nasty place to get into, with a lot of people having an extreme amount of snark. But the generosity of the miles/points community really shines, and this is one of the case where being in an online community is really helpful. Have any of you used this to get an Australian ETA with no fee? Comment below! Cool idea. I paid for an Australia ETA in January for my trip in July, then turned up to American Airlines ticket counter and was told that they couldn’t see the Visa, so they made me pay another $45. I’ve been in dispute with my CC company for months with no success. So, this “free” option would be great, but just make sure that your airline can actually see it. I have used the electronic ETA on two separate occasions with two different airlines (AC and EK) with no problems. Important to print out the ETA as soon as you purchase it from their site (you can enter later to print) so that you can show it to the airline checkin counter. Should prevent the problem you describe. I have used this before several times. It is only for experienced Flyertalk members who demonstrate paying it forward and also who strictly follow the instructions. Also, I don’t think if it is more widely advertised that it will stick around. Web site for Australia states that connecting flights with a longer than 8 hour connect time require an ETA. We contacted airlines (AC QA) to check and they stated ETA required. However – on arrival in Sydney it turns out an ETA is NOT REQUIRED as you stay on in-transit side of customs and immigration. So TWO wasted $20 ETA’s because of wrong information.